Did you know that Ergon Energy requires a customer to ensure that the power factor of any electrical installation measured at the consumer's terminals is not less than 0.8 lagging for installations supplied at low voltage. This is provided for in the Electricity Regulation 2006 (Qld). For all other high voltage connections, the power factor ranges are set out in the National Electricity Rules. Power factor is a measure of the ratio of the 'total power' kVA (also known as apparent power) that is demanded by your site and the 'real power' kW that is used on your site. The total power demand on the network is usually greater than the real power. The ratio of the real power to the total power is your power factor, a number between 0 and 1. The higher the power factor the more efficient your site is at utilising the supplied power. A business with a low power factor may result in higher capital expenditures and operating costs for the electricity supply company, compared to a similar business with a high power factor. And these higher costs usually have to be passed on to all customers in the form of higher tariff rates. 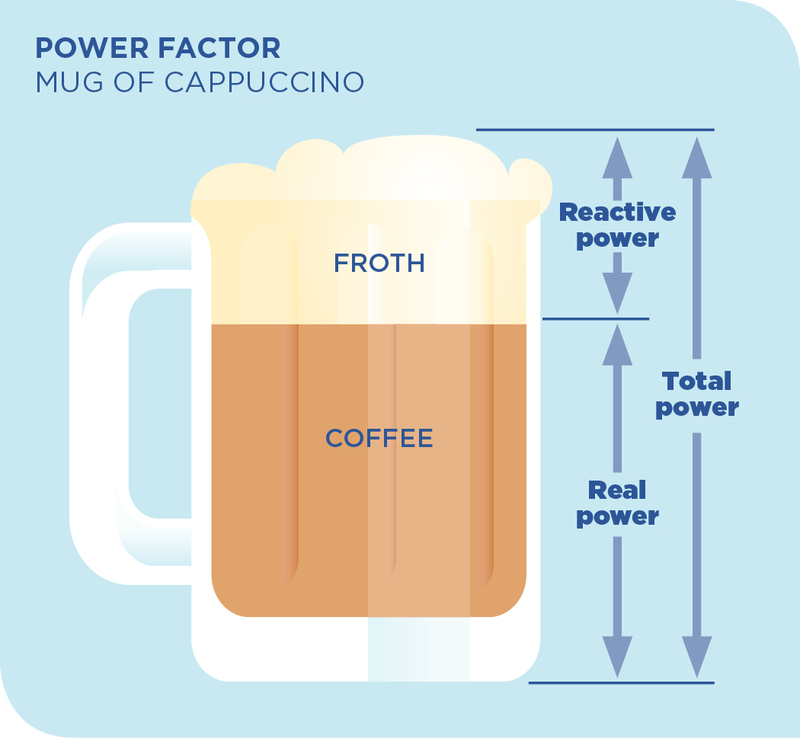 A simple analogy to explain power factor is that of a cappuccino. Here the mug must have sufficient capacity to contain both the coffee and the froth, corresponding to the total power. The froth represents the reactive power and the liquid represents the real power. We only gain real value from the liquid. Electricity metering may also have the ability to record power factor (typically ½ hour interval data) for the entire site and this information may be available from your electricity retailer. If you do not have the skills in-house, you may engage a specialist to assist you to assess your power factor and identify any causes and solutions to improving your power factor. A member of the Ergon Trady Ally Network may be able to help you. Arc furnaces and fluorescent lighting. A poor power factor can be addressed in a number of ways. The most common approach is to install power factor correction equipment (PFC). PFC equipment is essentially a capacitor bank – which stores and provides reactive power when required. PFC equipment can be applied to separate pieces of equipment or installed in bulk to the sites main switchboard. A poor power factor can also be corrected by fixing the problem at its source. For example, by ensuring that motors are not oversized, selecting pumping equipment with electronic variable speed drives (VSDs), retrofitting VSD's where possible, and choosing equipment that has good power factor to begin with. Electricity metering may also have the ability to record power factor for the entire site and this information may be available from your electricity retailer – either on your bill on request. Large sites will usually have in-house or contracted engineering or energy management expertise available who have knowledge of your plant and equipment and are often best placed to identify cause of poor power factors. Alternatively, either independent energy management consultants or suppliers/installers of power factor equipment will be required to identify the cause(s). Sites with the loads outlined above tend to have poor power factor. There are a variety of ways to improve your power factor but the most common solution is to install capacitor banks which provide the needed reactive power to either the load or the entire site. Implementing power factor improvement measures is a specialist skill and using qualified and experienced providers to design a tailored solution should ensure the best result for organisations wishing to improve their power factor. Once any power factor equipment or other changes have been implemented, it is important to measure and verify the changes in power factor that have been achieved and compare those to any pre-installation expectations. Installers of power factor correction equipment should be mindful to ensure the installation does not impact on the Ergon's network eg audio frequency load control. Once your power factor correction measures are implemented, like any electricity equipment, some maintenance is required to ensure the equipment continues to provide the expected benefits. Your supplier should provide advice on the necessary maintenance that is required to be undertaken.